‘Paradox’ – Great music, confusing story. ‘Many moons ago-in the future’, should just about sum this film up. This is billed as Darly Hannah’s directorial debut but in truth, it feels more like a project, as she learns the craft of film making. It certainly isn’t the finished article, although she does conjure some interesting visuals and ‘floaty’ sequences to give the whole thing a free-spirited, dream-like veneer. The best thing about the film is of course, Neil Young himself. Fans will be drawn to this because of him regardless of the content of the piece or whether it actually makes any sense. Much like other forays into musical film or TV, ‘Magical Mystery Tour’ springs to mind as it has the same loose hand on the storyline and camera work, the audience will gravitate to this because of the promise of the music, and with shots of Young and his mis-fit band playing and rehearsing new material. On that score it delivers. The premise of the story is that a band of futuristic cowboys search for technical treasures of the past to trade with women, every full moon, for food…and love. Neil Young plays the ‘Man in the Black Hat’, a throwback to previous western characterisers, like Clint Eastwood’s ‘Man with no Name’ or “The Preacher’. Other fantastic names include: ‘Particle Kid’ and ‘Jail Time’. ‘Paradox’ is by no means a garbled mess, just a showcase for Neil Young to look mysterious and interesting, it’s more than that. But does it live up to its billing? Does the storytelling engage you and carry you along to the sound of Young’s lamenting vocals? That’s the paradox. It promises so much but delivers little other than confusion, laced with moments of musical joy. Imagine the finest ingredients, the best recipes, but in the hands of a rookie chef. The best ingredients and recipe do not in themselves guarantee the best meal. ‘Paradox’ is written and directed by Daryl Hannah. 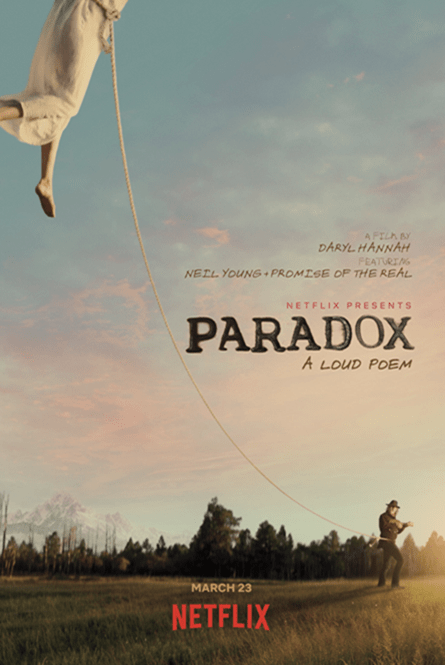 ‘Paradox’ features new music from Neil Young + Promise Of The Real. The cast includes Young, Lukas Nelson, Micah Nelson, Willie Nelson, Corey McCormick, Anthony LoGerfo, Tato Melgar, Charris Ford and Dulcie Clarkson Ford. The film is produced by Bernard Shakey and Elliott Rabinowitz, edited by Paul Snyder and photographed by Adam CK Vollick. ‘Paradox’ launches March 23 on Netflix.